Right-click on the chart/diagram to open the context sensitive menu. 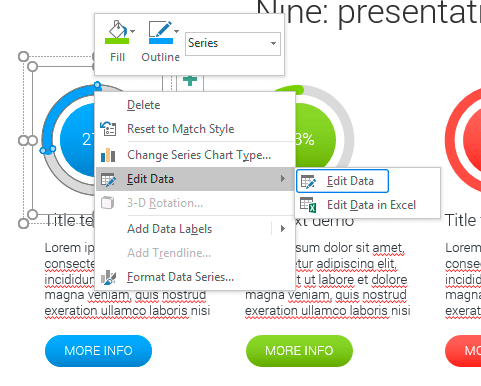 Select “Edit Data”. You’ll see a table in which you can change the required data, add new data or delete the group of data. Storing data in the table is done automatically, and in the graphical view you can instantaneously see all the data changes. You can call the same tool for data handling through the top toolbar. Firstly, select a chart/diagram that you want to change (left-click). Further, select Design> Edit Data at the top panel. All further changes are made just like in Option 1.